Heinrich and Maria (Heinrichs) Abrams with two grandchildren, 1904. Preservings Photo. Heinrich Abrams: pioneer and teacher; born 27 March 1832 in Grossweide, Molotschna Mennonite settlement, Russia, to Jacob and Katherina (Martens) Abrams. He was the third of six children in the family and one of two to immigrate to Canada. He married Maria Heinrichs (1836-1909) on 1 November 1856 in Marienthal, Russia. Heinrich and Maria had 13 children, seven of whom survived to adulthood. Heinrich died in 1910 in Manitoba. Heinrich Abram's parents had emigrated from Prussia as teenagers and settled in Grossweide, where they married and established their home. Heinrich’s mother, Katherina, died there in 1866. His father survived to immigrate with Heinrich and his family to Canada, making him one of the few people to take part in the emigrations from both Prussia and Russia. After Heinrich Abrams married Maria Heinrichs on 1 November 1856, the couple first lived in Grossweide, then moved to Wernersdorf, which was established in 1824, and later to Klippenfeld, a community established in 1863 on the Tokmak, a tributary of the Molotschnaya River. Another move was to Puchtin, a town north of the Molotschna settlement where travelers going between the Chortitza and Bergthal settlements could break their journey. In the last quarter of the nineteenth century, Mennonites were losing their treasured privileges and many people believed immigration to America was the best option. 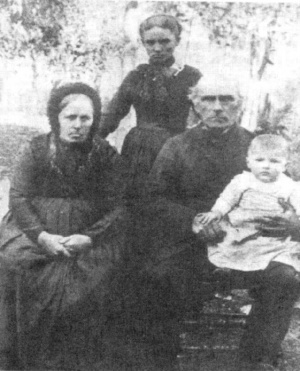 Heinrich and Maria Abrams also decided to leave for Canada, where Heinrich could teach and farm in freedom. Heinrich’s brother, Peter, and his family immigrated at the same time, together with their father, Jacob. On 10 July 1875, the group embarked on a journey from Hamburg, Germany to Hull, Quebec in the company of 348 other Mennonites from the Molotschna, Bergthal, and Chortitza settlements. Heinrich Abrams and his extended family set out to transplant their lives and communities into a new country. Their eventual destination was southern Manitoba, where they hoped to establish farms and villages like the ones they had known in Russia. Together with 12 other families, the Abrams clan helped establish the town of Grossweide on their arrival in Manitoba. As families moved away, however, the village’s remaining members had to join the nearby community of Schanzenberg. Heinrich and his family lived there until they moved to the Halbstadt area of the West Reserve, near where his brother lived. Arriving in Canada in 1875 was difficult for Heinrich Abrams and the other settlers. A devastating infestation of grasshoppers that year had destroyed the surrounding vegetation, but a late crop of hay helped to alleviate the hardships many settlers experienced. In addition to farming Heinrich was also a teacher. He taught in the Wernersdorf School in the Molotschna settlement. In 1879, he received a Manitoba teaching certificate and so he was also a teacher in Canada. After his retirement, Heinrich and Maria went to live with their children in Halbstadt, Manitoba. Heinrich died there in 1910. Heinrich Abrams persevered through many difficult times and numerous transitions. His adaptability and willingness to use his teaching and farming skills helped his family to flourish. Barkman, Cathy Friesen. "Heinrich Abrams (1832-1910) and family." Preservings No. 11 (December 1997): 76-77. GRANDMA (The Genealogical Registry and Database of Mennonite Ancestry) Database, 5.03 ed. Fresno, CA: California Mennonite Historical Society, 2007: #221724. Huebert, Susan. "Abrams, Heinrich (1832-1910)." Global Anabaptist Mennonite Encyclopedia Online. 2007. Web. 22 Apr 2019. http://gameo.org/index.php?title=Abrams,_Heinrich_(1832-1910)&oldid=128539. Huebert, Susan. (2007). Abrams, Heinrich (1832-1910). Global Anabaptist Mennonite Encyclopedia Online. Retrieved 22 April 2019, from http://gameo.org/index.php?title=Abrams,_Heinrich_(1832-1910)&oldid=128539. This page was last modified on 15 December 2014, at 15:55.